If you’ve been in the pickleball community for any amount of time, you have probably heard of Simone Jardim. Simone is currently regarded as THE top player in the women’s game. She has won every major tournament in pickleball in singles, doubles and mixed doubles. In many cases, she has won them more than once and in some cases she has triple crowned at a single event. We are so happy to announce that we were able to get Simone on court with us to share with you a game that she used during her tennis career and has now adapted for pickleball. 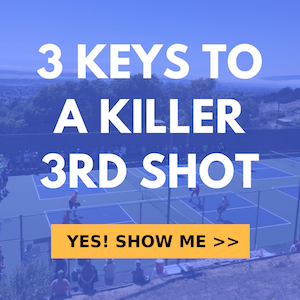 This is a great game that makes it fun and easy to work on dink consistency and a few other key shots necessary to play great pickleball. The game is called Dingles. It is played with 4 players and everybody starts out at the NVZ line and there’s two balls going at the same time to start. And, you have to keep the ball going cross court initially. Each pair cross court with each other works with one ball. It needs to stay inside of the kitchen, so it’s a cross court dink rally. There is an imaginary line in the middle of the court dividing the kitchen in half for this first part of the game. Once, one of the cross court pairs makes an error. That pair must yell out “Dingles” and the remaining ball can be played anywhere on the court among all 4 players. Any shot can be hit from that point. You are no longer listed to just cross court dinks. Each ball scores a point. So each time you start, there are two points up for grabs. First, the cross court dink rally, and then the 2nd ball that goes live after that between all 4 players. One team may have one both “balls” and scores to points or they could’ve split the points. If this seems confusing, please watch the video and all it will all become clear. That is the 1st version fo dingles. In this 2nd version of dingles there is a tweak to how the points will start. 1 team is serving, one team is receiving. Both players on the serving team will serve cross court, the receivers will return cross court and come in, the servers will hit a 3rd shot drop cross court and come in. They must hit a drop on the 3rd shot, They cannot drive it. Now all 4 players are at the net and and the dink rallies cross court begin. The rest of point is played out in the same way as the 1st version. Definitely check out the video up top. It’s pretty simple once you see it. Thanks Simone for showing us this awesome drill!